Discussion in 'Design and Graphics' started by JPLC, Dec 20, 2011. 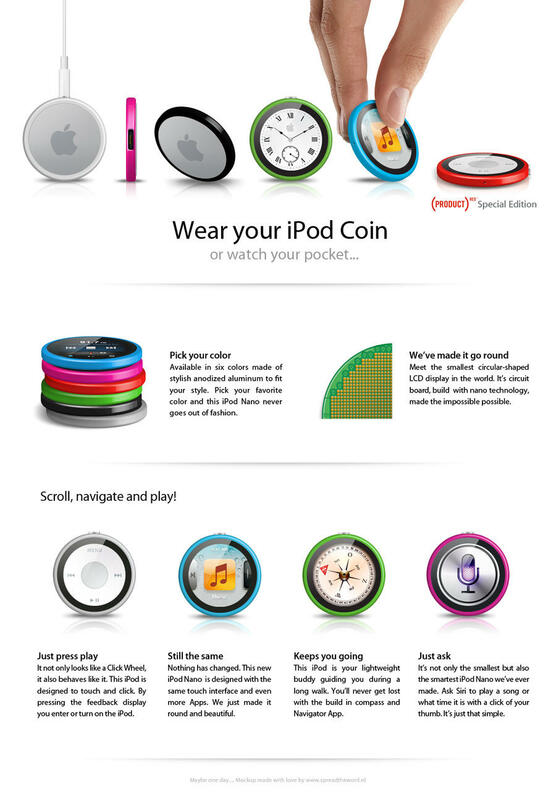 After reading the rumors about the new "wearable" iPod nano my imagination took a run with me and this is what I've made. 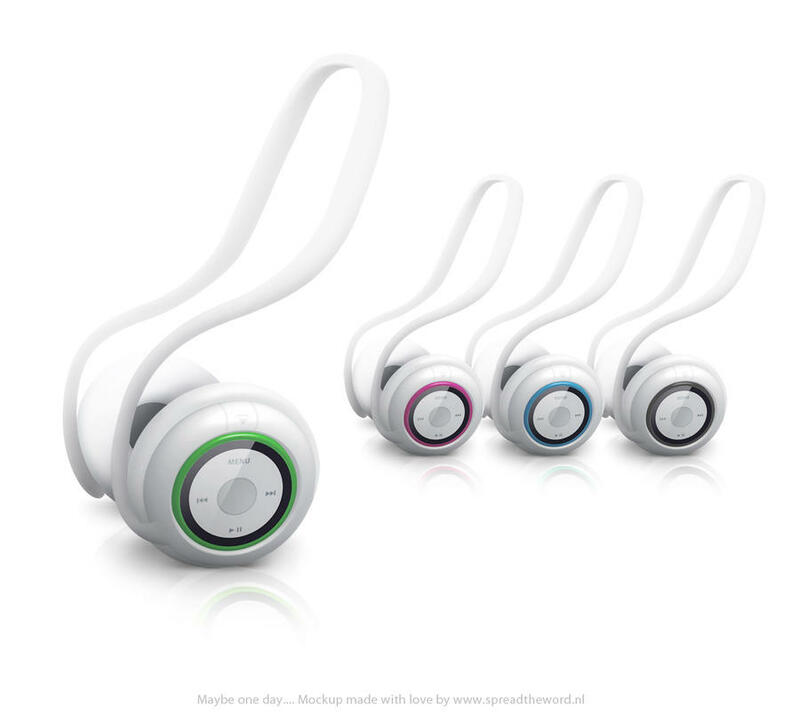 - Wearable as a wrist watch, pocket watch or necklace. I realy hope you guys like my design! Not bad actually. Nicely done. Love the concept, even though I probably wouldn't buy one! Does look pretty neat and nice mock up. Idea of the touch screen click wheel is amazing. Good job. Awesome... Well done - Concept, Art and Copy! Wow! Thank you all for the possitive feedback! Great! How about the round display technique? I know it's there (not the thick round border on top of a square kind of displays..) but it's hard to find information about this subject. Even though I have an iPod Touch, I'd probably buy one for myself just for music. It's a very beautiful product and very unique. I was dubious at first but seeing how you worked the OS in there it's really nice! Lovely! At that time, they were already talking of round displays. I'm sure if Apple orders enough of them, they can find a manufacturer to build them. From an aesthetic point of view, I'm not crazy about the double border. I'd like the screen to go all the way to the color ring, or make the black go all the way to the edge. I'd also make the back color match the frame. - dock connector: I suppose a micro-USB would do the trick. - headphone connector: should be standard mini connector. - lock switch: to prevent accidentally activating the iPod. Of course, since we're dreaming, we could recharge it using an inductive pad, sync it via wifi, and use bluetooth headphones (also inductively recharged). Your faux prototype looks also really good! Looks like you're good in 3D graphics. I'm lucky that this design is bevelled and round. It seems more realistic because of the edge that is needed to feed the displays pixels. I'm not a specialist but I can imagine that some space is needed to build something like this. Same thing with the feedback display. Second: It creats a contrast with the body color of the iPod. When you place a picture on a colored background, a black border creats a better contrast with the picture. Same with the display which makes it look brighter and saturated. Maybe the black version would be something for you? Maybe a feedback display can take away the lock button function. I can imagine that you turn it on by holding it three seconds or so. Micro USB or inductive charging for sure! Wireless syncing would be better maybe and inductive charging would complete that idea so a Micro USB port wont be necessary. Thanks for the spelling tip. I fixed it! I love the dock connector closing lock on your Nano Watch! Great solution! Yes, I like the black better. I think it's the thickness of the outside ring that bugs me. Looking at Apple products, you'd see just an edge (http://www.ifixit.com/Guide/Installing-iPhone-4-Display-Assembly/3148/10). Look around the site. For example, 1st-3rd generation nano has a thicker metal bezel and no blacked out glass, but the 5th-6th generation have black on the glass. The site will also give you an idea of the component sizes so you can work to scale. Prototyping like this is fun, as well as figuring out some technical solutions. I hope you continue and share your ideas. Wow that is actually pretty cool! Honestly, I'd probably pick one up if Apple did ever choose to make it. It would have bluetooth headphones I think. Which software did you use to design the iPod? I've made some subtile changes in the layout. Now all the iPods display an App. Just the way Apple would present it. Strange thing is that after this news nothing seems to be produced with this technique. This could mean two things: It's to expensive or hard to produce and it's just a protoype or experiment. The picture looks pretty fake though. Second... further developments are kept secret because somebody (some company) want's to use this technique to build a very orinal and exclusive product... Rumors say that Apple and LG are already doing business together using displays for new iPads and iMacs. I can imagine than Apple does some shopping in the kitchen of LG and could be interested in this new technique. If you ask me, I think that the phone market has grown out of the smaller display market when you look at sales numbers of smartphones. So the best products to use small circular display would be MP3 players, info displays in cars, display buttons or other electronics. So what happened with this technique and where did it go?! @ MacSince1985 - I see! You're right about that. I must say that the black border is something I like. That's the hardest part, making objective choices. I'll keep it this way but I dare you to make on without border. I've got no idea how off-topic we can go but it would be great to use this tread to expand this idea. So you're more than welcome to make an example how you think it should look like. @ chrf097 - Great to read that you would buy one. Mission accomplished! @ imswimmin - No nit-picking at all! Thanks for helping me out. English isn't my primary language (Dutch that is) so any help is very welcome! Glad you like the concept! @ Mantasis - For sure! I can imagine that this kind of iPod with build in WiFi and/or Bluetooth would make a great accessoire for the iPhone. Same thing with wireless headsets. @ Hexiii - I picked the best iPod color combination suiting the Apps. Maybe that's why but I must say, I really like the idea of an one-button-fits-all App. It's more futuristic that way. Makes me even think about movies like 2001 a space odyssey or Minority report. I'm reading the Steve Jobs biography and just reached the iPhone chapter last night. The screen was originally designed to be inset in the case, just like the iPod classic. It's only late in development that Jobs decided to make the screen (or at least the glass) cover the entire front surface. The same chapter also described how Corning had developed a special glass 30 years earlier but did not find a market for it until it was needed for the iPhone. The same situation is true for round LCDs. They are possible and available, but not manufactured in large quantities (yet) because few devices use them. I found a few other round displays. At least one is readily available. I may take you up on your offer and try a variation on this idea. The gorilla glass? I've read it myself. Great biography. It's very inspiring to read how these great idea's turn into reality. Johnny Ive is a genius and together with Jobs a greater sum than the parts. Lets hope so about the round LCD. When you look around, you alomst get annoyed of all these square diplays and screens. The retina screens blew my mind. I'm sure there's more to come but still not sure about the round display. Doesn't keep me from dreaming. I've tried something that looks more like the iPhone 4. No double edges and glass on both sides. Something like you described am I right? I hope you like it. It's quick and dirty but worth trying. The second idea is pretty cool too. (Wouldn't stop me from probably buying one. ) Although, I personally feel that the iPod Nanos represent the quirky and fun side of Apple's line; the Touches, iPhones, and Classics the more serious side. I kinda prefer the colored ones, but I guess that's just me (and perhaps several others). It looks good nonetheless.